TOKYO (AFP) -A 5.6-magnitude quake hit western Japan early Monday, injuring five people and damaging buildings and roads, as officials warned stronger tremors could come in the days ahead. The shallow tremor was reported as magnitude 6.1 by the Japan Meteorological Agency (JMA), according to Kyodo news agency, although the United States Geological Service Survey (USGS) gave its strength as 5.6. The Japanese agency urged residents to stay vigilant. 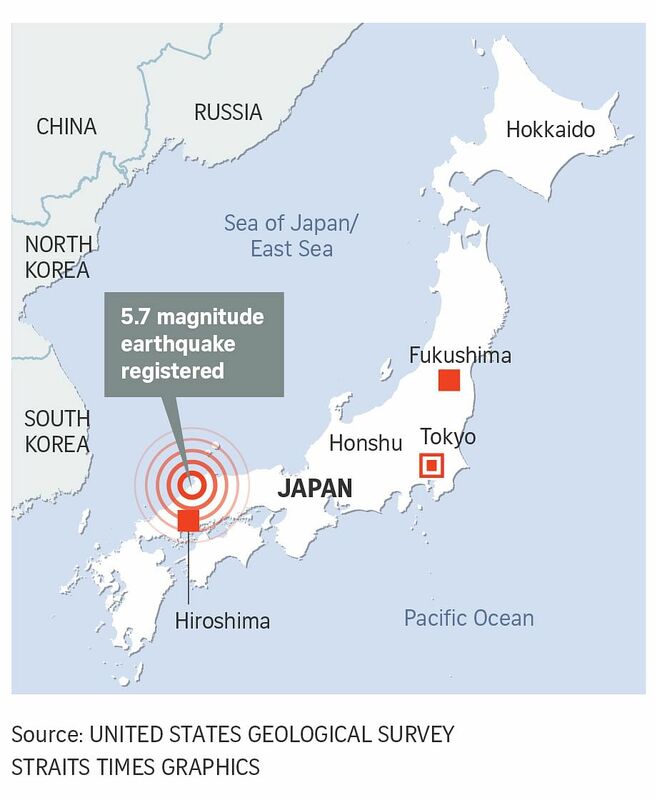 The quake rocked the west of the main island of Honshu, with the epicenter 96 km north of Hiroshima. Damage to some buildings and roads were also reported. No problems were reported at the nearby Shimane nuclear power station, which has been offline for a checkup. A devastating magnitude 9.0 quake - which struck under the Pacific Ocean on March 11, 2011 - and the resulting tsunami caused widespread damage and took the lives of thousands of people.